BRING 'EM BACK ALIVE was that other 1982-83 US thirties adventure series inspired - at least in part (and, in the eyes of the network mandarins, probably entirely) by the success of RAIDERS OF THE LOST ARK in the summer of 1981. 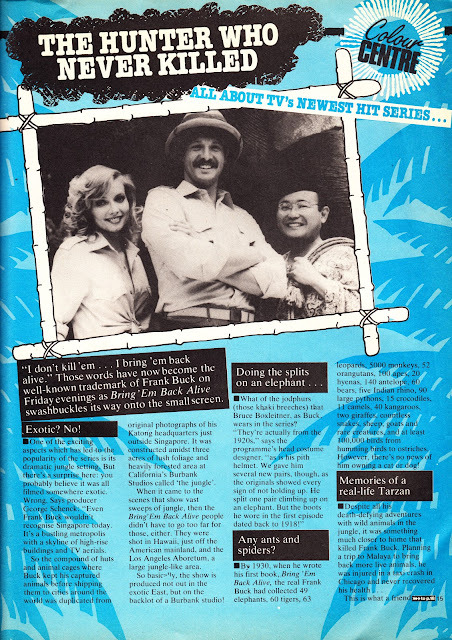 ABC offered-up the more fondly remembered TALES OF THE GOLD MONKEY whilst CBS took a punt with this show about real-life big game hunter (but not - as the title suggests - killer) Frank Buck. The show was set in Singapore but shot entirely in California. Everyone remembers Gold Monkey (Kirk's replacement from ST:TMP, flying boat, dog with an eye patch and a cracking theme) but Bruce Boxleiter's (latterly of BABYLON FIVE fame) improbable moustache (MAGNUM premiered in 1980, the beginning of the crime-fighting-facial-fuzz trend that also dragged in RIPTIDE and SIMON & SIMON) has been all-but-forgotten. 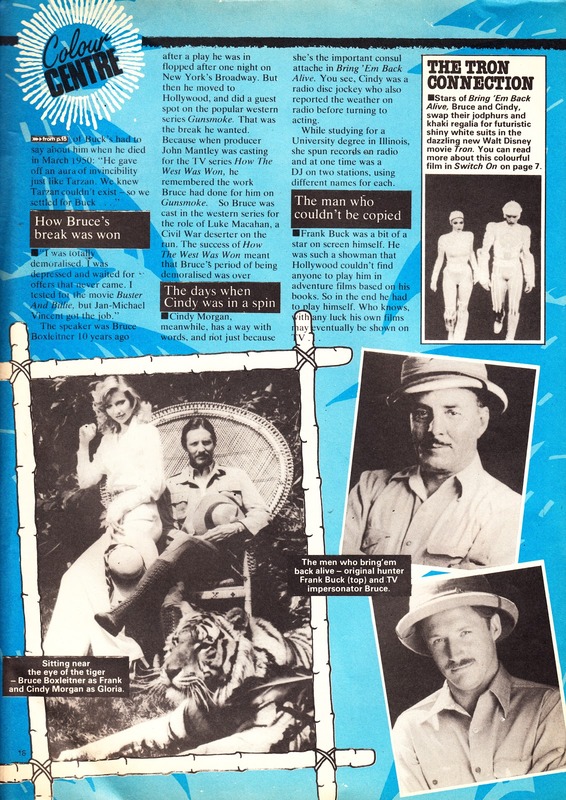 This is a cover and pull-out centre spread from a November 1982 issue of the UK kids weekly LOOK-IN, showing that ITV was airing the show only a few weeks behind the States (the first episode aired over there on 24 September). It doesn't say in the article but I think the show may already have been on-air a couple of weeks when this piece appeared. 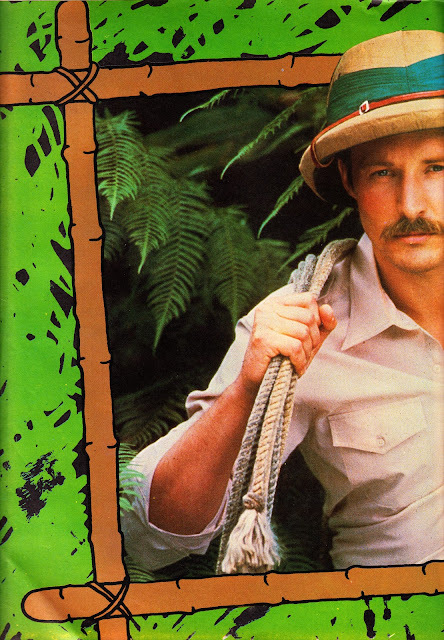 ITV was networking the show in the 8.30 slot on Friday nights (Jungle fans take note: Biggins' campy kids game show ON SAFARI was running on CITV a few hours earlier). 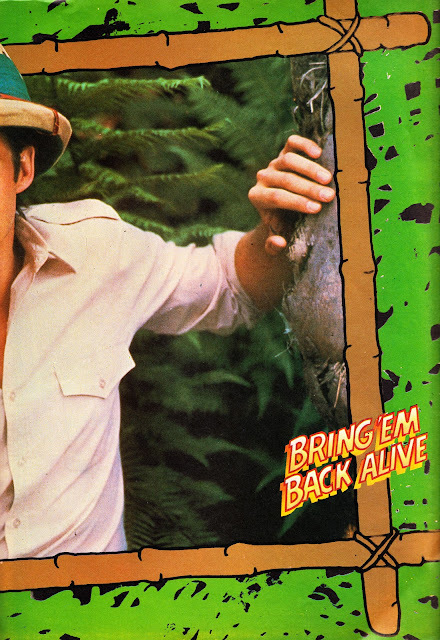 ALIVE only managed 17 episodes before cancellation in 1983. GOLD MONKEY fared little better, clocking-up only 21 episodes of flying time before being permanently grounded. Neither shows generated much merchandise although both mustered the obligatory Grandreams annual. GOLD MONKEY has enjoyed a belated release on DVD (and stands-up well today) but ALIVE has been entirely overlooked, allowing bootleggers to fill the gap with (generally shoddy) off-air recordings. Neither series have been seen on British TV since their initial outings.